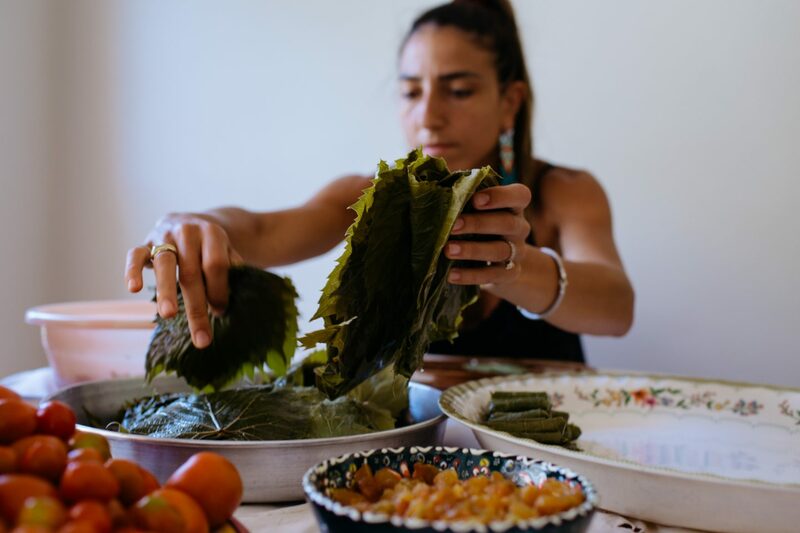 She’s a passionate home cook who is currently obsessed with collecting old recipes especially the ones of her Tayta’s (grandmother’s). 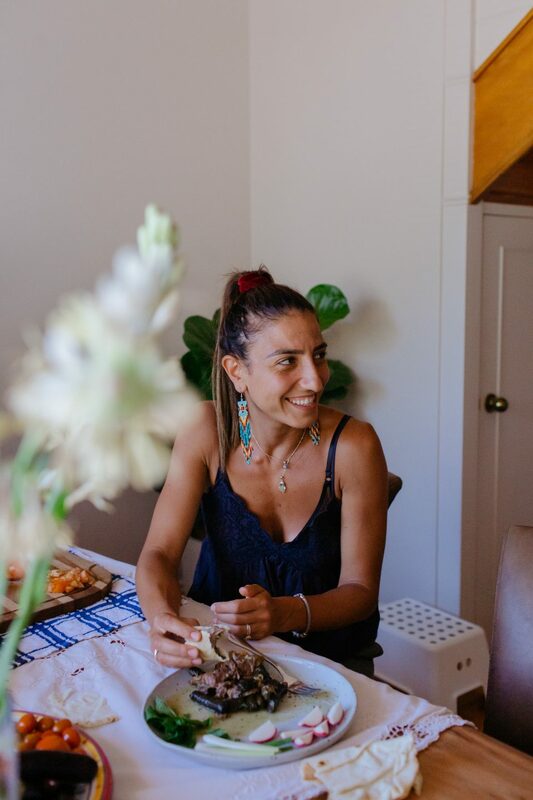 Karima has always been drawn to the history of food and how it was done back in the days. Her grandmother had 15 children and her Mum was number 14. Growing up, Karima would go to Tayta’s house and sit on a mat in a circle because that was the only way to fit everyone in! 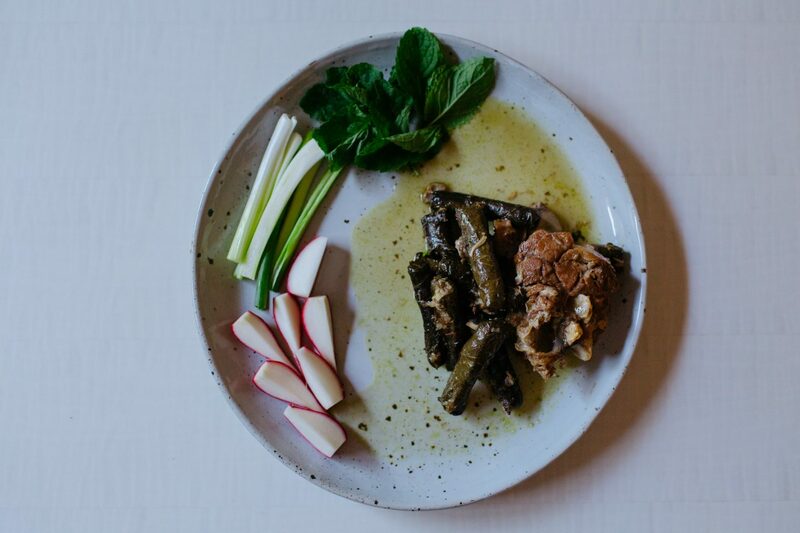 When Tayta cooked Warak Enab (Lebanese Vine Leaves dish), it would take 3 women to tip over the deep pot. 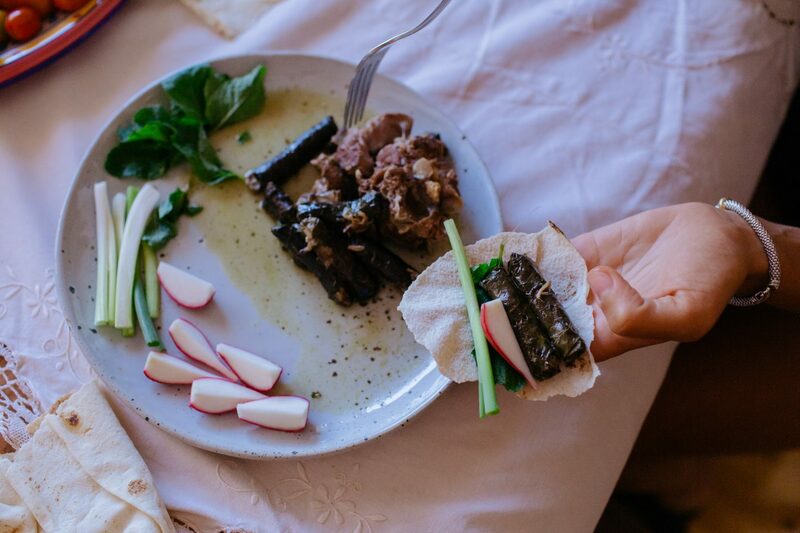 Everyone would eat from the deep tray of vine leaves, lamb, bone and marrow. Everyone had to be quick because soon there would be no more. “I am forever grateful for those memories,” said Karima. Childhood taste Mums Chicken with broth and vermicelli rice and extra lemon! 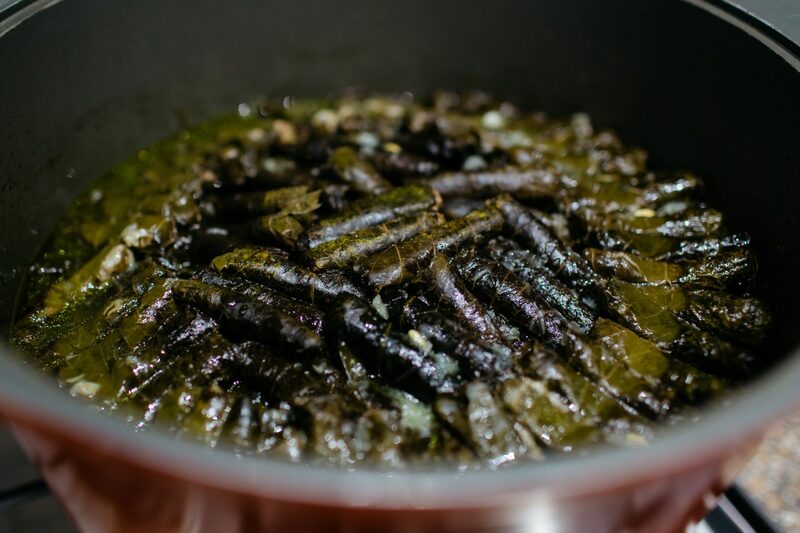 This is a very traditional recipe and method. It should be treated more as a guide rather than an exact recipe. 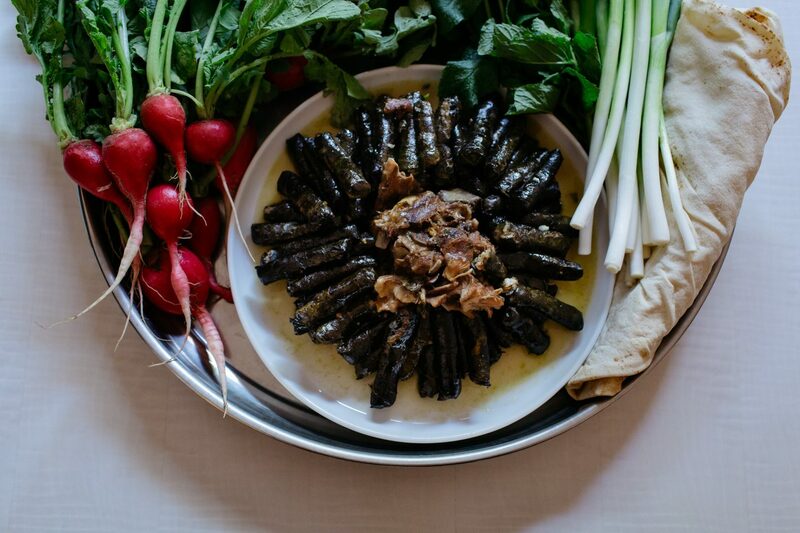 With all cooking but particularly traditional Lebanese cooking tasting and smelling along the way is extremely important as well as knowing what to look out for. 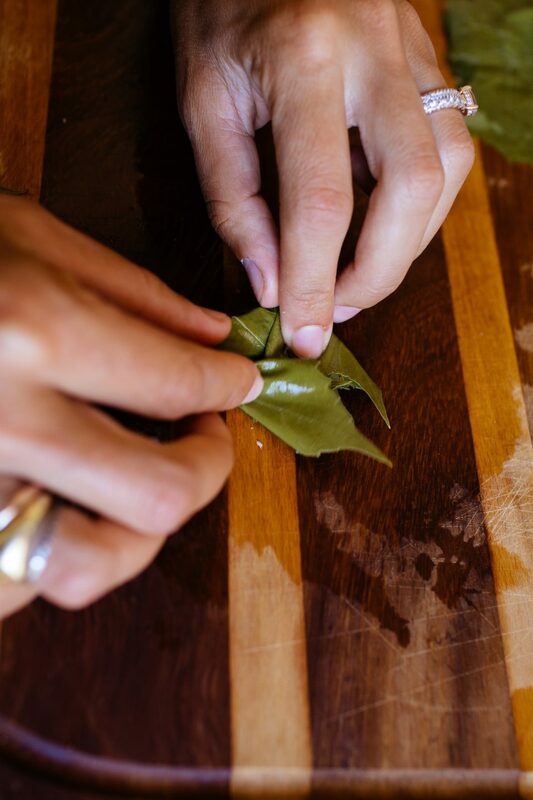 Preparing the leaves. 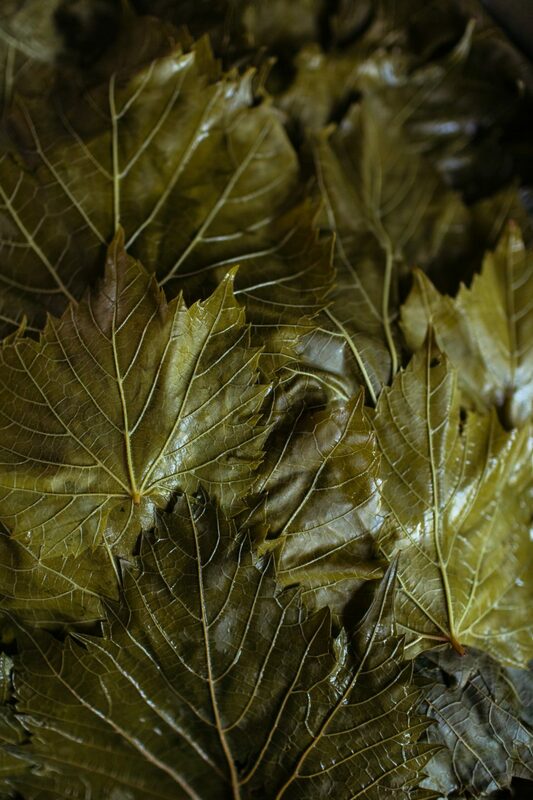 Wash and soak the fresh leaves in water to remove any excess dirt, the leaves should be a fresh vibrant green colour. 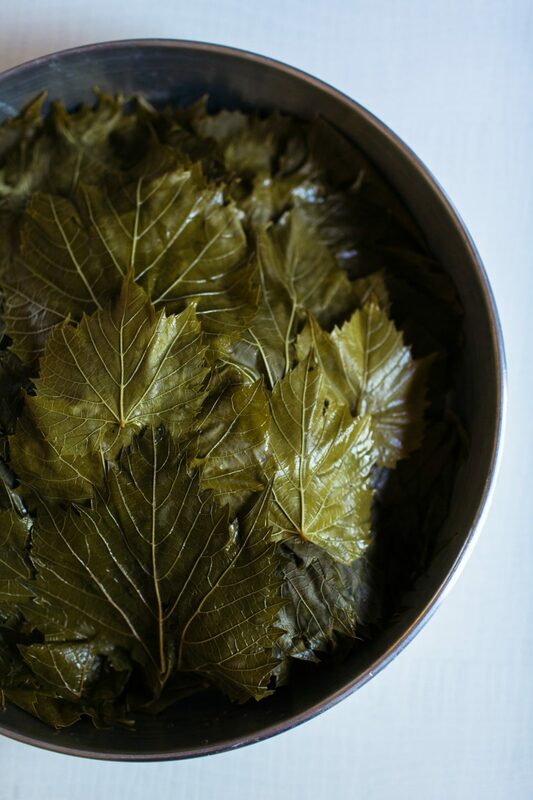 Bring a pot of water to the boil and submerge a handful of leaves at a time to blanch until they turn a khaki green colour, repeat with all the leaves. Put in a strainer over the sink and run cold water over them to cool down. Allow to cool and then place on a tray ready for rolling. It is important the leaves are cool so as to not spoil the stuffing mix. Whilst the leaves are cooling you can begin your stuffing mix. Place rice, mince, salt and spices and kneed together with your hands so as to bring it all together. On a clean, flat, wet surface (ie. chopping board) lay a leaf flat with the rough side facing you and the smooth side of the leaf on the board. 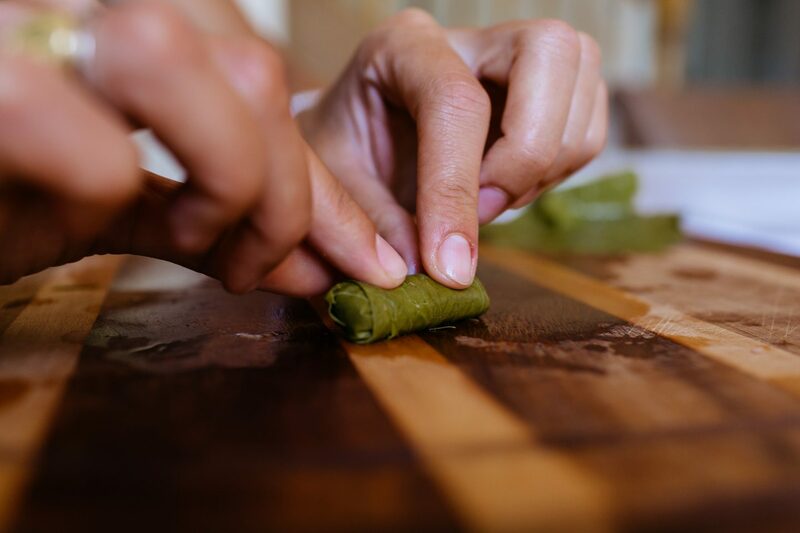 The amount of filling will depend on the size of the leaf, but the aim is to have a uniform of rolled leaves to allow for even cooking. 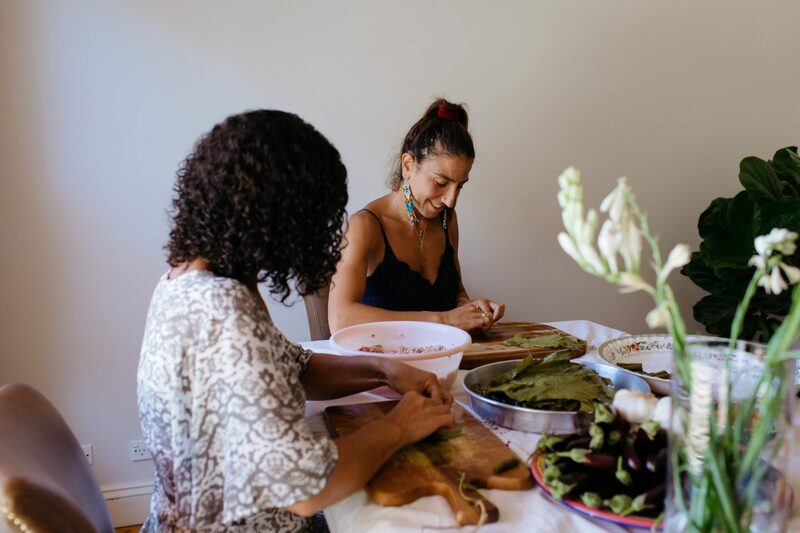 Therefore if you have two quite small leaves you can place them along side one another overlapping half way to form a bigger leaf or if you have a giant leaf you can cut it in half down the centre. 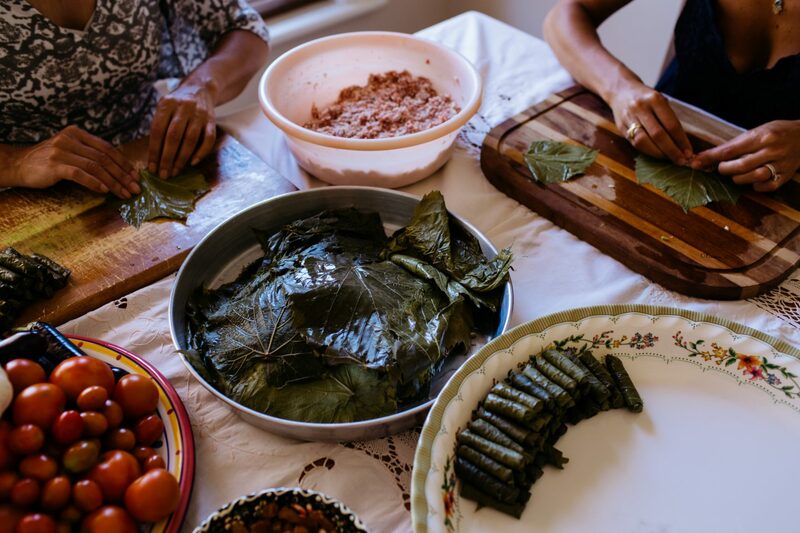 The average leaf should be palm size and requires 3/4 – 1 pinky length and thickness of stuffing, remembering the rice expands when cooking. 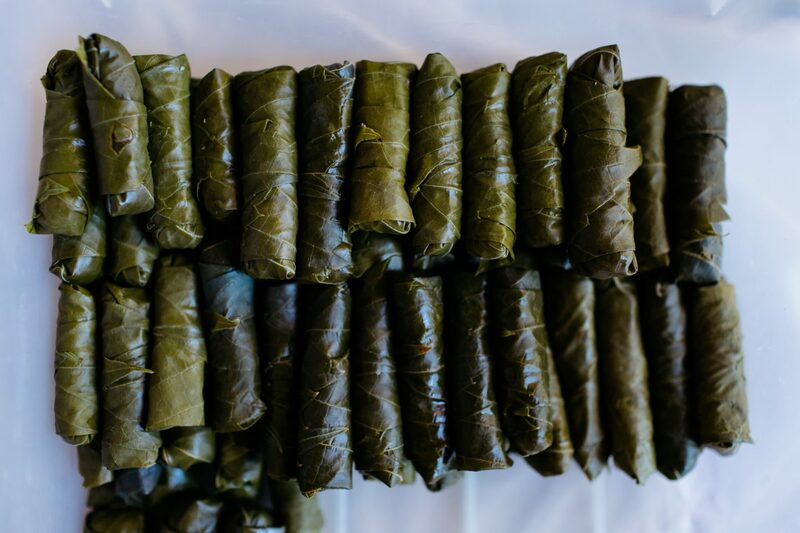 Ensure you are relaxed and not tense whilst rolling the vine leaves. 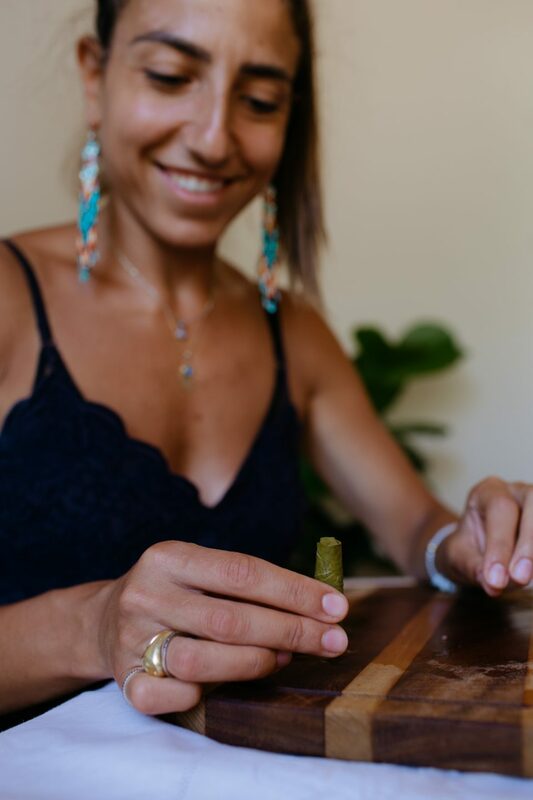 Place the filling about a centimetre from the base of the leaf, roll it to half way to ensure the edges have tripled and then tuck them into the centre. Be sure to press on the centre and pull it towards you to keep it tight. Preparing the meat. Place the meat and bones in a clean sink and rinse very well with cold water. Place meat and bones into a pot with water and bring to the boil. Remove the layer of scum that comes to the surface. Then drain the meat in the sink and wash off any excess that is on the meat with cold water. In a 10 litre pot add a tablespoon of ghee and toss the meat and bones on high to seal adding salt and Baharat spice to the pot. Turn the stove off and assemble the meat and bones as compact as possible. 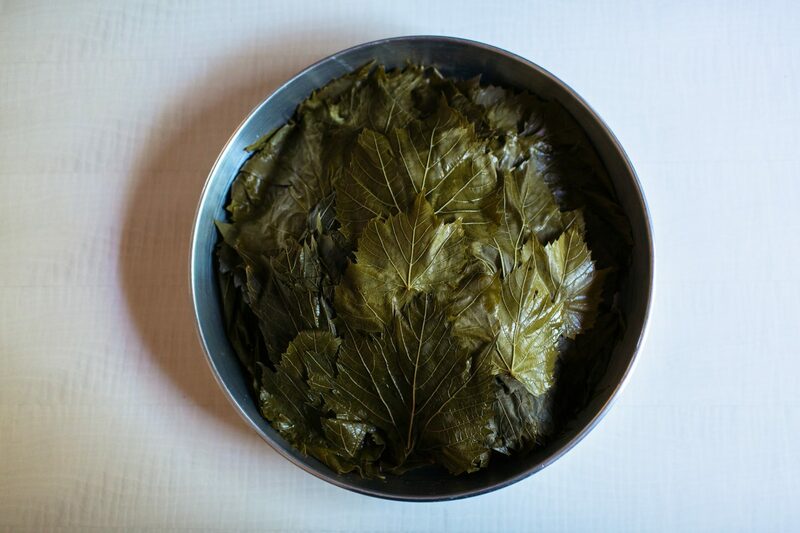 Pack the vine leaf rolls in a circle around the pot one by one and in any gaps in between the meat and bones. 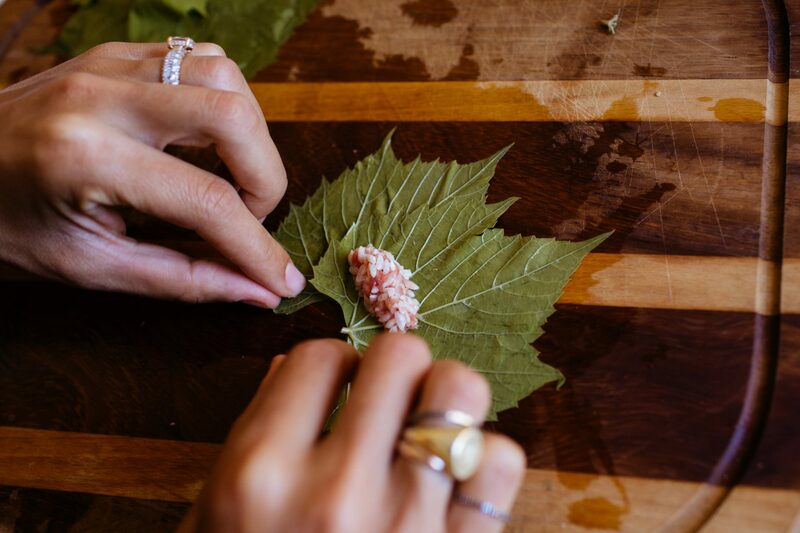 Repeat this all the way to the last vine leaf roll. 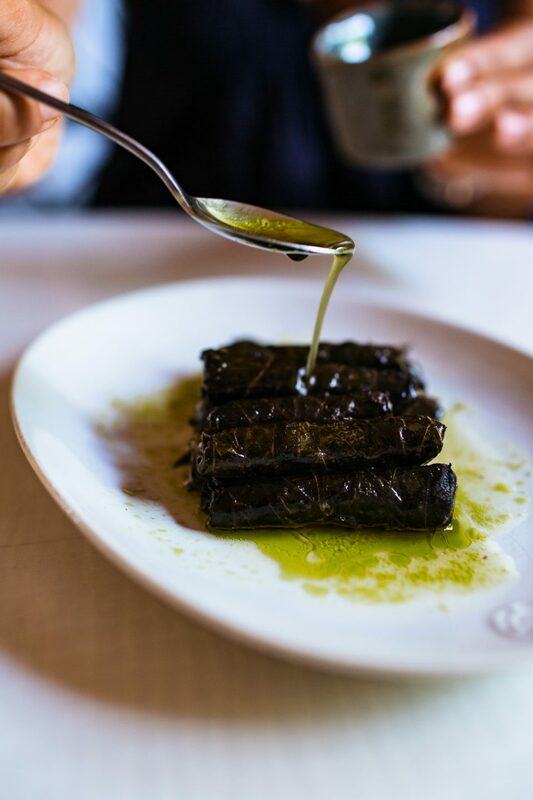 Place a heat proof plate face down to press down on the vine leaves and put a big rock on top to apply pressure to the plate. Cover with the lid. Add 6 cups of water to the pot. Tilt your pot to the side, if the water gushes to the side you have plenty of water for your 20 hour cooking. If not add your 7th cup of water. However, 6 should be enough. Cook on high for 30 mins and then turn down to low and cook through over night. After about 15 hours of cooking squeeze 3 lemons, maybe even 4 depending on personal taste and add to the pot, lifting the sides of the pot and swirling the lemon juice all around. 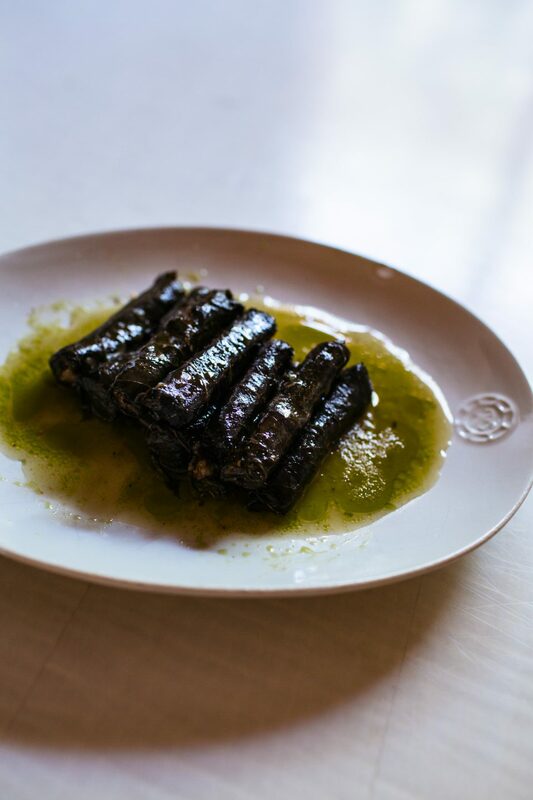 Ensure you keep tasting the juice of the vine leaves and adjust with more lemon accordingly. By now the liquid in the pot should be a shiny, dark and a rich green colour. Cook on high for approximately 20 mins. Then bring down the heat to medium and keep the pot covered for 20 mins. 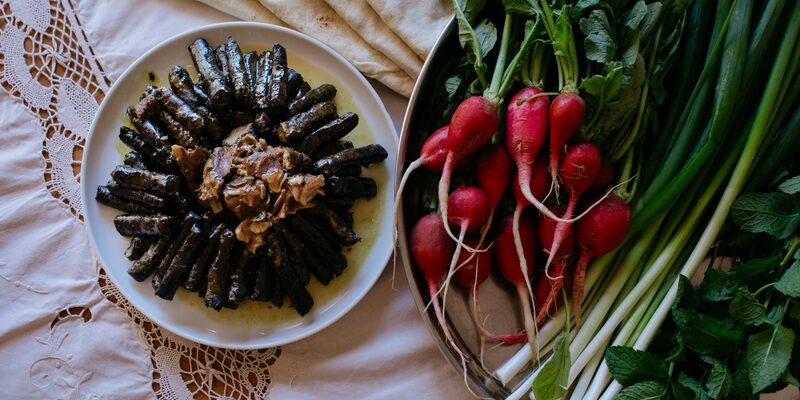 Uncover pot and keep cooking for another 20 minutes to cook and sizzle the top layer this will also caramelise the lemon with the pan juices of the vine leaves. 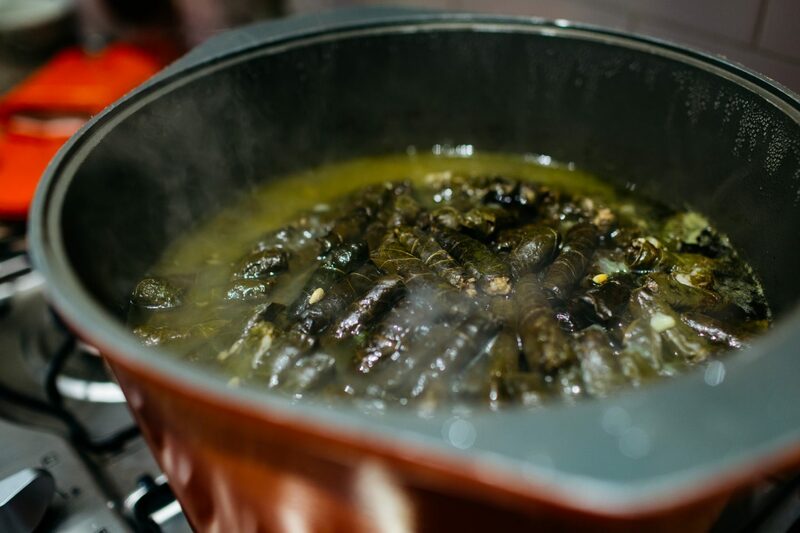 Serve by tipping over the pot into an extra large deep serving dish, the vineleaves should fall to the bottom and the meat should be falling off the bone at the top. This is certainly a two or three person job. 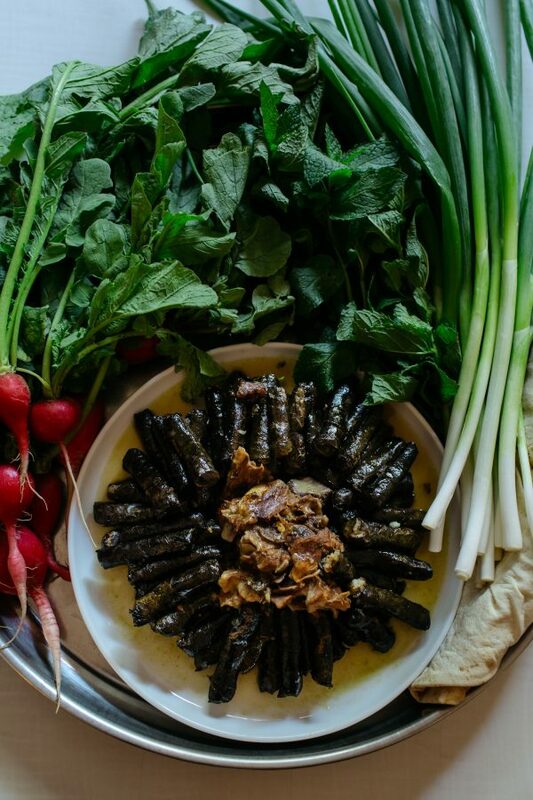 Serve with fresh raddish, spring onion, mint and fresh Lebanese bread. 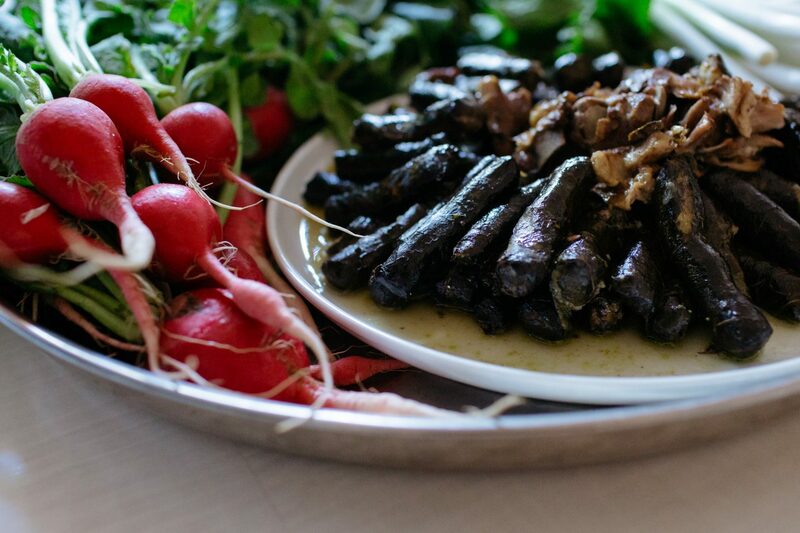 Best enjoyed eating with your hands.